August 2017: The fast moving St. Lawrence River at the eastern edge of Pointe-St-Charles. Walk in the Water | Marcher sur les eaux (2016- ongoing) is a research and creation project that uses visual art and oral history to explore the St. Lawrence River’s shoreline at the de-industrialized Montreal neighbourhood of Pointe-St-Charles, from environmental and social perspectives. The project draws on current and previous writings and interviews with local residents as well as with experts from the disciplines of urban planning, history, political ecology, botany, literature, sanitary engineering, environmental studies, water ecologies, and more. The purpose of Walk in the Water | Marcher sur les eaux is to raise awareness of the specifics and complexities of our River, of some of the many ways that people can and do connect with its waters and creatures, and to encourage affection and advocacy for this remarkable environmental and cultural feature of central/eastern Canada. Flowing more than 1200 kilometres from freshwater to salt, from its origins at Lake Ontario to the largest estuary in the world at the Gulf, the St. Lawrence River is an essential natural and cultural resource. The shores of the river and its tributaries are home to over 80% of Québec’s population, and 50% of Quebeckers get their drinking water from these watercourses. 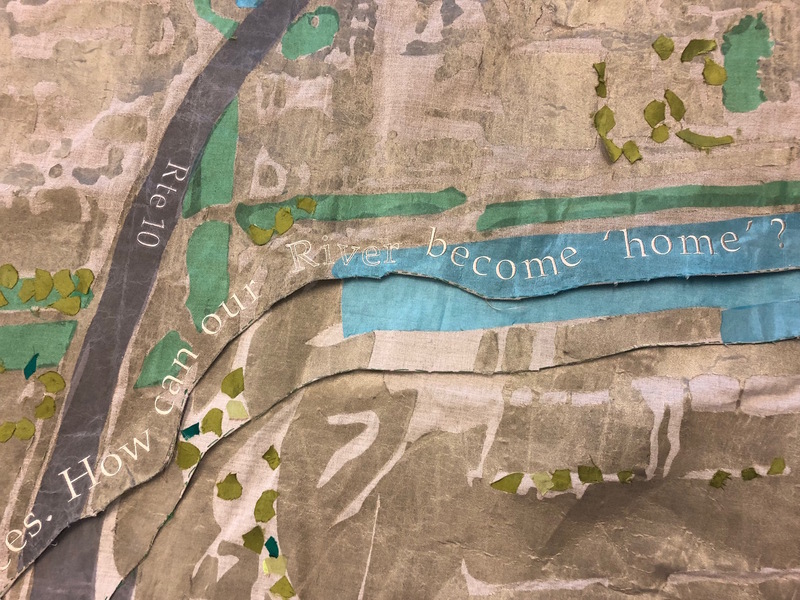 a wall-sized textile map of the shoreline’s changes, which features multiple layers of pieced and embroidered cloth denoting the flowing river and its changed boundaries, as well as touch-activated audio excerpts of river stories. Walk in the Water as installed at Concordia’s Webster Library, October 10-November 12, 2018. Presented as part of the History Inhabits Each of Us exhibition created for the Oral History Association Conference, hosted by Concordia and the Centre for Oral History and Digital Storytelling. Photo: Richard-Max Tremblay. Six layers of linen and two layers of organza comprise, respectively, the shoreline of the Point as it existed at marked moments of time, extended almost a kilometre from 1801 to 1968, pushing the River further and further away from citizens. 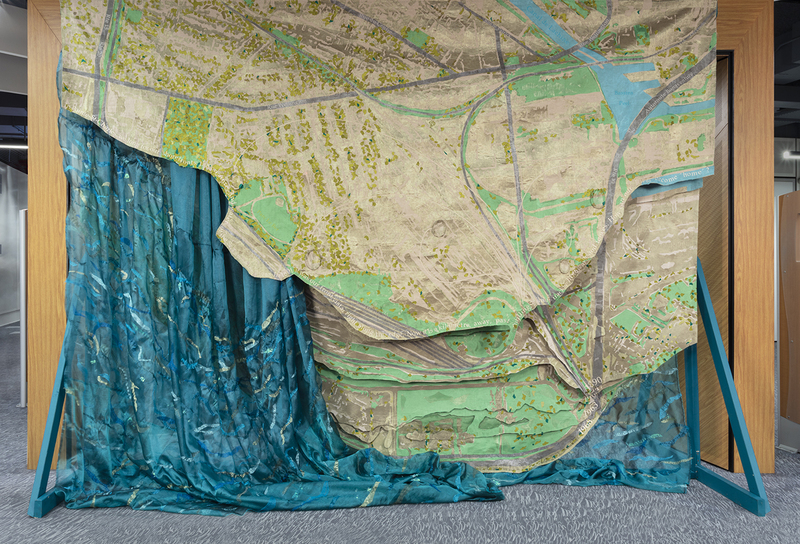 The blue organza , completed with stitched rippled waves, indicates (near layer) where the St. Lawrence would once have been, very close to human habitation, and where it now is, sequestered behind railways, highways and fencing. Photo: Richard-Max Tremblay. 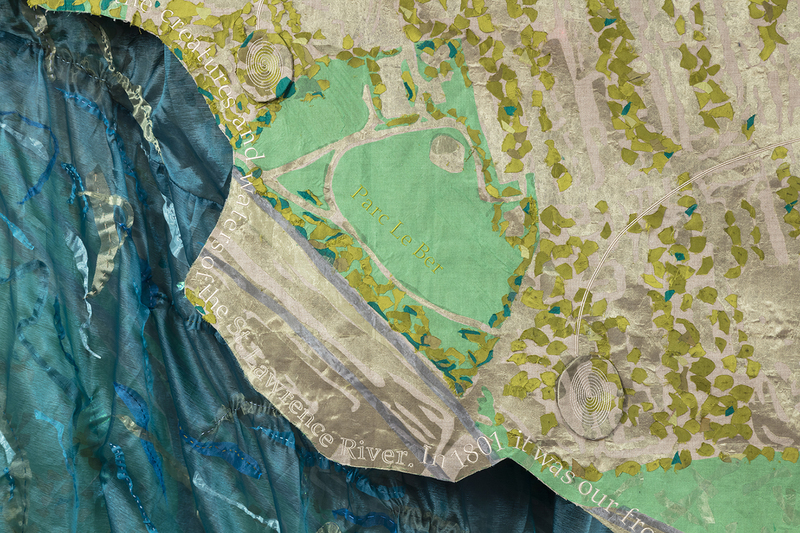 A closer view of the map, with colour piece-work depicting the terrains, industrial structures, roadways, parks and trees of Pointe-St-Charles, with principal elements labeled with digital embroidery. Also visible here, the two oval ‘switches’ that, activated by human touch, play back excerpts from interview with locals and experts about the River. Photo: Richard-Max Tremblay. 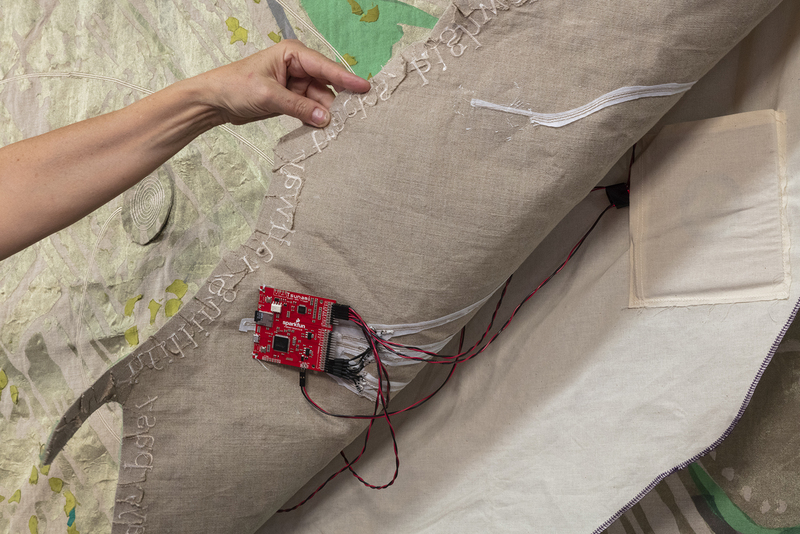 The underside of the top layer of the textile, revealing the red square Tsunami WAV trigger, with mini-SD card that holds audio excerpts, plus the backside of the conductive wiring that links this trigger to the switches on the right side. The stitched box at right encloses the small speaker and digital amplifier that play back the audio excerpts, one for each switch. Photo: Richard-Max Tremblay. an audio walk that juxtaposes features of the original (as mapped in 1801) and the current shoreline (completion 2019). Additional public art projects (e.g. 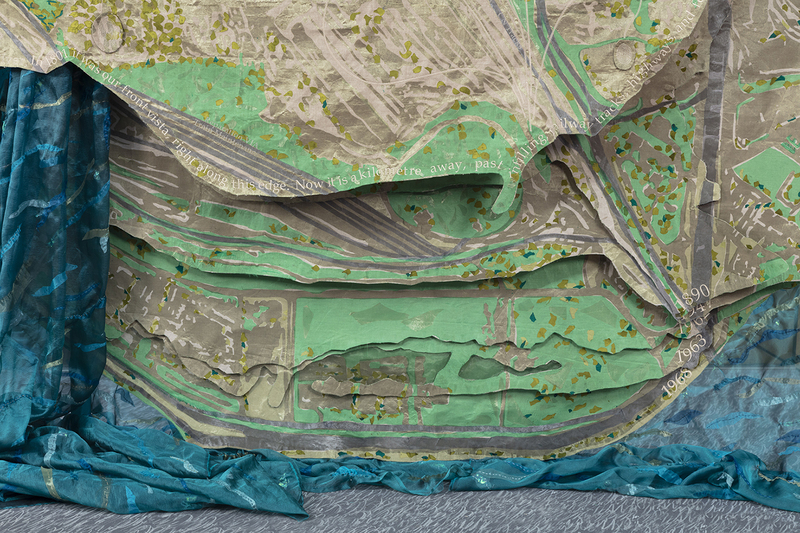 a visual installation that traces the original shoreline) may also be created, integrating data collected from multiple sources. Walk in the Water will be shown via exhibitions, public events (e.g. organized group walks), and academic and general interest writing, with audio walks available via digital download from this website. Walk in the Water builds on Kathleen Vaughan’s ongoing work based in ‘the Point’ and her interest in and collaborations about water and its meaning (for instance, via the Waters Lost, Waters Found Working Group at Concordia University) and encompasses related water-y projects such as Gardens of Water (2017). Walk in the Water | Marcher sur les eaux was conceived by Kathleen Vaughan and developed with input from and the assistance of Jill Bennett, Joanna Donehower, Emma Hoch, RythÂ Kesselring, Jacob Le Gallais, Philip Lichti, Nicole Macoretta, Gen Moisan, Kay Noele, Martin Peach and Eric Powell, as well as special funding from Concordia University. 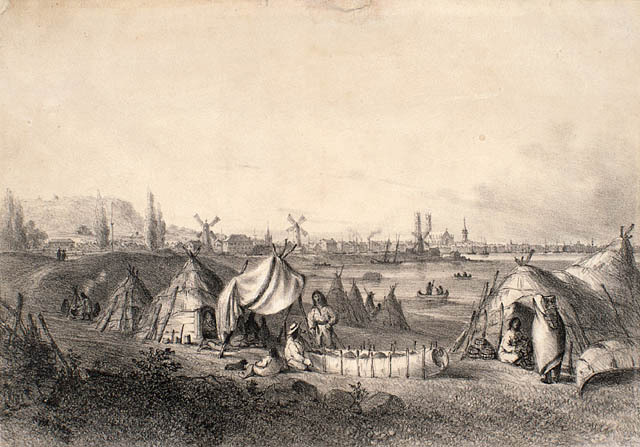 Shoreline as per 1840s James Duncan engraving of Montreal from the Indian encampment. Archives of Canada. 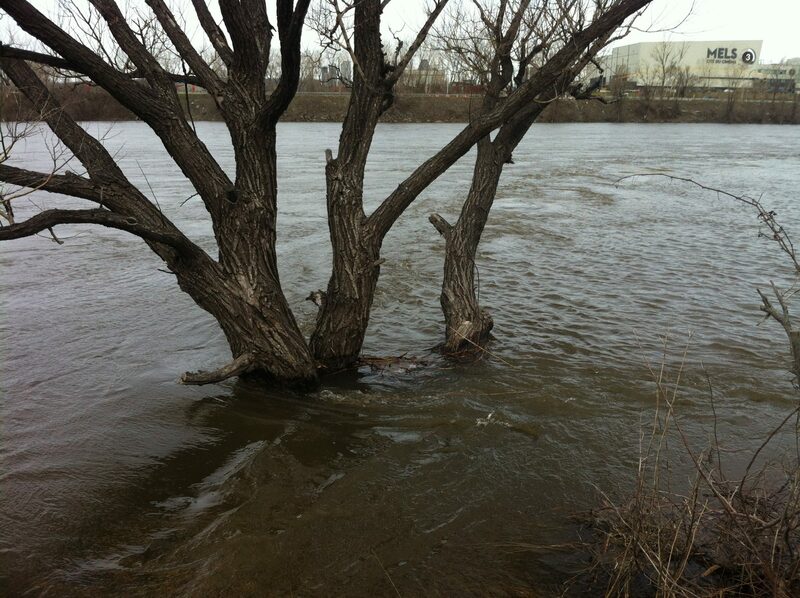 Once, the St. Lawrence River flowed directly alongside – and would seasonally flood – the low-lying, boggy land of the part of Montreal now known as Pointe-St-Charles. When European settlers arrived in the 1500s, an actual Point reached into the river, creating a sheltered upriver cove at which was later built the Maison St. Gabriel. This 300-year-old fieldstone house, centrepiece of the farm of the Sisters of the Congregation of Notre Dame, was a stopping point for the young French immigrant women known as the ‘Filles du Roi’ | King’s Wards who crossed the seas in the 1660s to make this land their home. 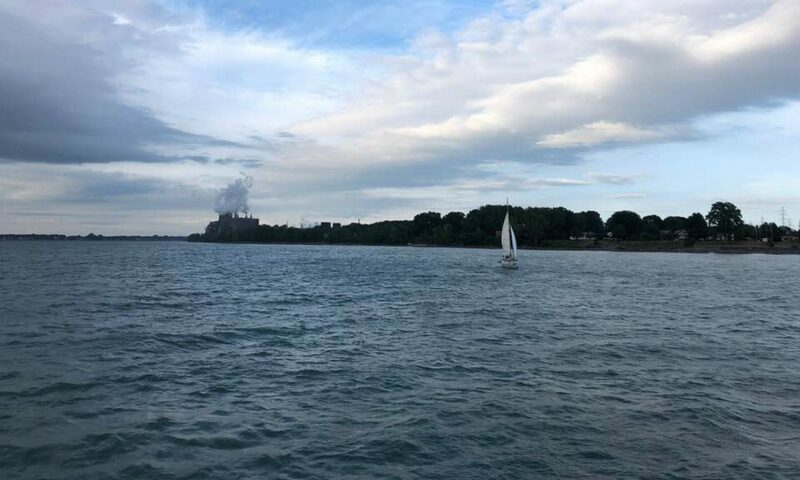 The Nuns and their wards used the nearby island (Nuns’ Island | Île des Soeurs) as a planting site, and would call their requests for harvest across the waters. But the River is no longer in view of the house, which still stands. Over the last 200 years, the shoreline itself has been dramatically changed as a result of dumping (the area once served as the city garbage dump) and infilling (with ground excavated to create the Lachine Canal in the 1820s and 1840s and the Montreal subway system in the 1960s). Now, much of the Point’s terrain by the river is described as being contaminated soil, not fit for human habitation. Instead, it is home to Industrial building of railway lines, Highway 10 and a Technoparc, which means that the river is hard to access from the residences of the Point. It takes a determined human visitor to get to this part of the island – and yet non-human life continues. On the St. Lawrence approaching the Victoria Bridge, constructed 1854-60, and the eastern edge of Pointe-St-Charles. Photo: Kathleen Vaughan, November 2017. 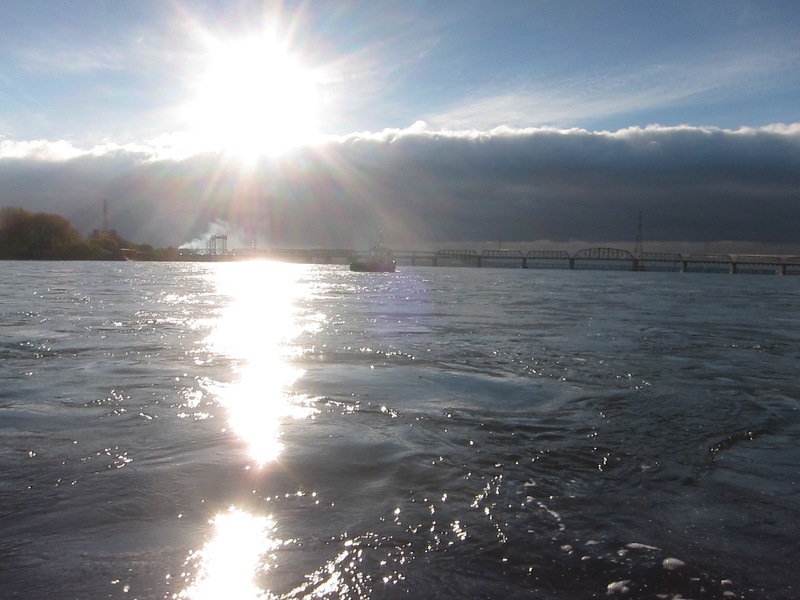 Montrealers have strong feelings about our River, as shown in November 2015, when many responded with anger and dismay at the City’s proposal to dump raw sewage directly into the St. Lawrence (at the eastern edge of – or just downriver from – Pointe-St-Charles) in order to perform essential maintenance of holding tanks. Scrutiny by federal and provincial government environmental watchdogs delayed but did not stop that dump, which some locals recall with shame. Many Pointe-St-Charles residents dream of a day when their shoreline is once more accessible, and given the same loving treatment and public investment as Verdun to the west, with its boardwalks and beaches, and the parks and greenspaces of Cité du Havre and Île-Ste-Hélène to the east. 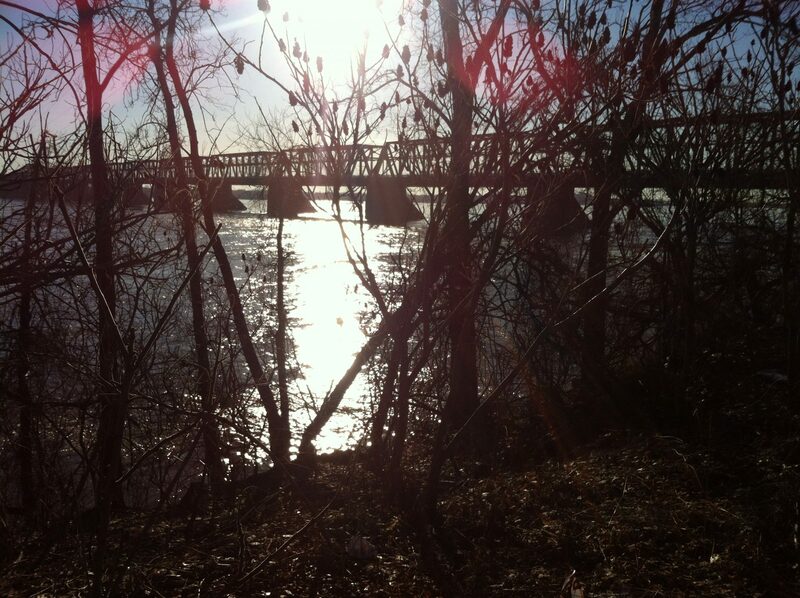 What is the Pointe-St-Charles riverscape now? What do we think of when we imagine this little-known shoreline? What would it mean to walk in the water? How can our River become ‘home’? The Point’s shoreline shifts were first brought to my attention via a 2010 article in Spacing Montreal, which mentions prior research by the Société d’histoire de Pointe-St-Charles and local architect, Mark Poddubiuk. thank you for your beautiful ambitious work in textile. Your choices of subjects, materials and technical execution are thought-provoking. Wonderful already online. I hope to see the piece in the exhibition.